I’m recently back from two weeks in Japan with Julian Hough and Dave Provencher. We had a blast and saw heaps of great stuff. Over the next several weeks I hope to roll out at few posts related to that trip…some ID stuff, and some basic trip report stuff. Fixing the formatting on this blog is also something I'd like to get around to. One of the locally scarce birds we were lucky to see in Japan was this Northern Shrike on Hokkaido. In speaking with an experienced local, they are just about annual. We had two encounters with the bird. On our second visit we were able to secure photos, including a couple of in-flight shots. These are heavily cropped and unedited. 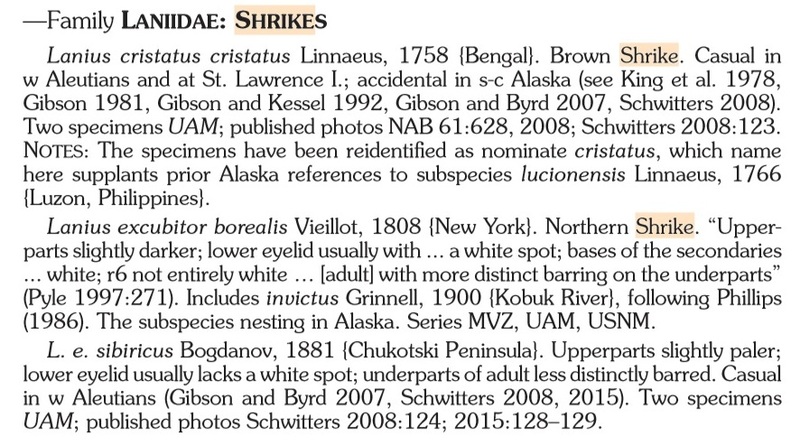 The Holarctic “northern gray shrikes” underwent a bit of a taxonomic shakeup in 2017. 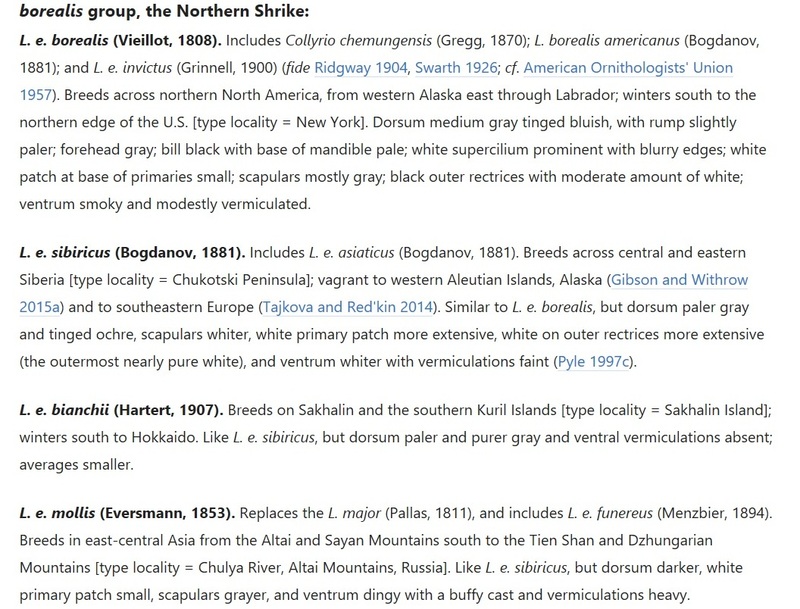 Per the AOS, they were split into Northern Shrike and Great Grey Shrike. But the line drawn was not a clean North American versus Eurasian split as one might have assumed it would be. 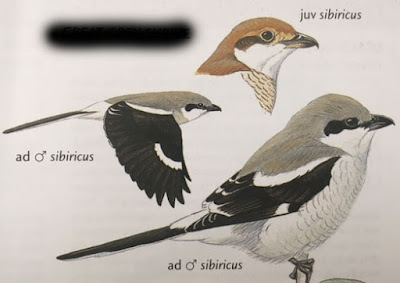 Rather, the East Asian form(s) were combined with the North American form(s) to be called Northern Shrike (Lanius borealis), while the central and western Eurasian forms are called Great Grey Shrike (Lanius excubitor). So there is a line drawn somewhere on the Asian mainland. Shrike taxonomy is rarely straightforward. - Thin, short white line above the eye between the black mask and gray crown. This line is subtle and short, occurring only above the eye and slightly behind it. Open wing and tail photos are helpful when trying to separate certain shrike taxa. First, it is worth ruling out Great Grey Shrike, as unlikely as that would be…but vagrant shrikes are very much a thing. In my cursory review of Great Grey Shrike images combined with a couple internet and book references, it appears that Great Grey Shrikes show at least SOME white on the secondaries (anything from a narrow line to a large patch), while Northern Shrikes do not. Our bird’s white patches are restricted to the primaries. There is no white line at the bases of the secondaries. L. b. sibiricus – The widespread Siberian form. Per Mark Brazil’s Birds of East Asia, this form winters rarely to Hokkaido. 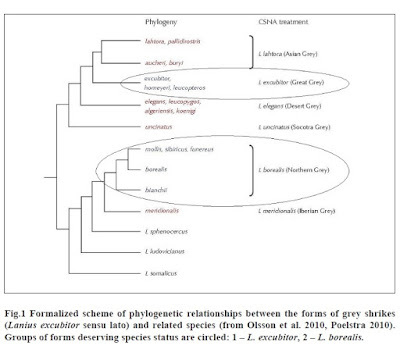 L. b. bianchii – Apparently breeds on the Kuril Islands (which are visible from Hokkaido!). Per Brazil and Birds of North America Online, this form winters south to Hokkaido. It seems that this form isn’t terribly well known, which is not surprising given its location and restricted range. L. b. borealis – The North American form, and presumably the least likely to occur on Hokkaido. This form breeds as nearby as Alaska and is migratory/irruptive (they all are). Obviously the two Asian forms are far more likely than the North American form (borealis). I do not know if borealis has ever occurred in Japan. This figure is also borrowed from Tajkova & Red'kin. 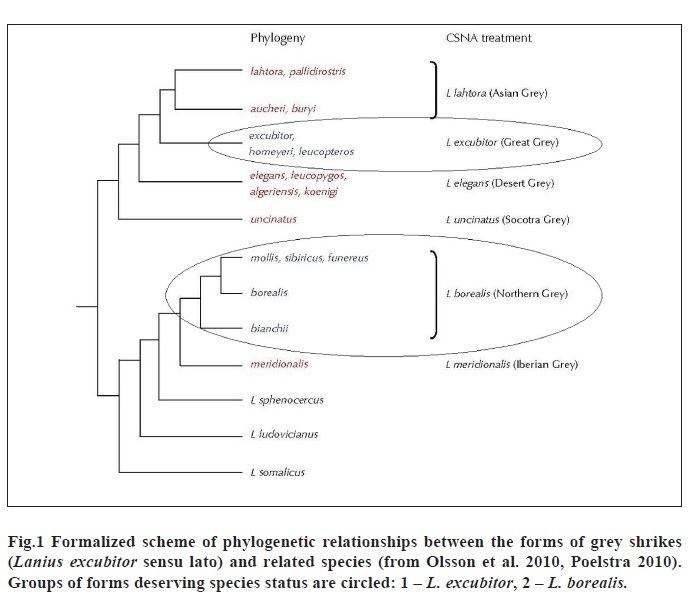 Note the position of bianchii in relation to borealis and sibiricus, and that Northern Shrike and Great Grey Shrike are not each others' closet relatives. There is some contradiction in the literature on how to separate borealis from sibiricus, which makes this task more difficult. 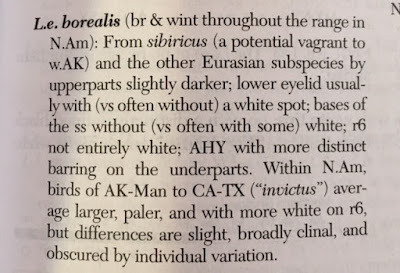 For instance, Pyle states that sibiricus often has some white at the base of the secondaries (contrary to the above screenshot from the Ukrainian paper), and that sibiricus has an entirely white r6 (the only source I found that claims this). Using that criteria, our bird would not fit sibiricus very well. However our bird’s lack of obvious ventral vermiculations and lack of white spot on lower eyelid are pro-sibiricus, per Pyle. 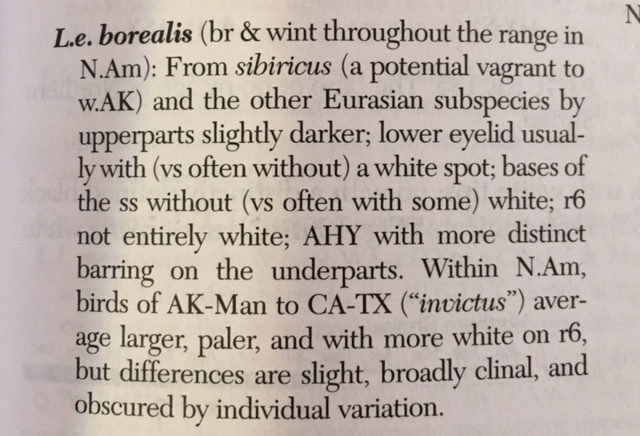 To confuse things a bit more, this Western Birds account essentially quotes Pyle, but there is a typo in the borealis section, which here states that borealis should have white at the bases of the secondaries. Oops. Here is what Brazil’s field guide has to say. He addresses bianchii in the text. 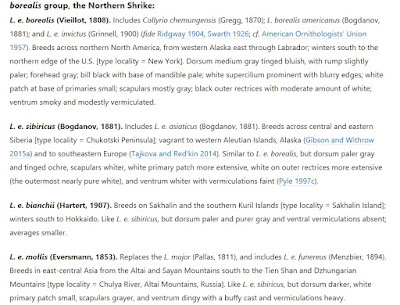 The picture did finally clear a bit when I checked the Birds of North America Online account, which is thorough and addresses all relevant forms. There is some contradicting information between the above sources, and certain field marks noted by some sources are not mentioned at all by others. Clearly this is an identification that is being worked out, if it can even be done with confidence in the field. An eBird search of Northern Shrike images from Alaska (presumed source of potential vagrant borealis to Japan) reveals that adult-like birds indeed average a more extensive white border between the gray crown and the black mask than our bird shows. It appears like more of a white line above the entirety of the mask in the Alaska birds, while our bird really just shows narrow white above the eye with only a bit extending behind. The ventral barring also seems to be readily visible on the AK birds, which reflects my personal field observations with eastern US/Canada adults. A couple of those photos of Alaskan adults show little/no vermiculation below, but this may be wear-related as those images happened to be taken during summer. Here are my current thoughts on this bird from Hokkaido. I don’t think it is borealis. Two of the few things that most of the sources seem to agree upon are the presence of a more obvious white supercilium on borealis combined with more obvious ventral barring. Our bird does not fit that description. Add that borealis would be a vagrant to these parts, and we are probably dealing with one of the expected Asian forms. Which Asian form? Don’t know. As little as I have been able to learn about sibiricus, I know even less about bianchii. It may be significant that this bird didn’t seem to show much (any?) ventral barring, which according to BNA may be pro-bianchii. If anybody has anything to add or correct, please do. Thanks! Brazil, M. 2009. Birds of East Asia: China, Taiwan, Korea, Japan, and Russia. New Jersey: Princeton University Press. Cade, T. J. and E. C. Atkinson. 2017. Northern Shrike (Species Account). Birds of North America Online. The Cornell Lab of Ornithology. Gibson, D. D. and J. J. Withrow. 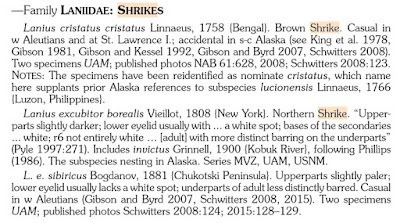 Inventory of the Species and Subspecies of Alaska Birds: Second Edition. Western Birds 46(2):94-185. Pyle, P. 1997. Identification Guide to North American Birds: Part 1. Bolinas, California: Slate Creek Press. Svensson, L., K. Mullarney, and D. Zetterstrom. 1999. Birds of Europe: Second Edition. New Jersey: Princeton University Press. Tajkova, S.U, and A. A. Red'kin. 2014. 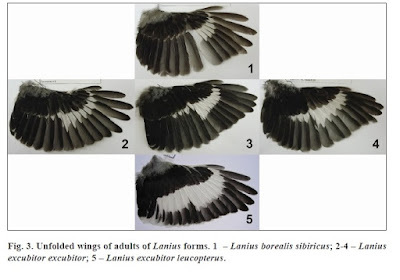 The Northern Shrike Lanius borealis sibiricus Bogdanov, 1881 (Aves: Laniidae) in Ukraine: a taxonomic assessment. Journal of the National Museum 103(8):89-107.